← Installerstore Accepting Amazon Payments! 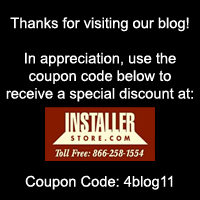 It’s time again for the Installerstore SUPER Coupon Code Event! Now through Sunday February 1, SAVE 5% on your order using our SUPER coupon codes. Pick which team you think is going to win the big game by using their corresponding coupon code during checkout. Still bitter about your favorite team not making it or do you have no preference? Simply choose the code “none15”. * Codes cannot be used in conjunction with any other coupon/discount. *5% discount is not applied to shipping costs.